Every week Allan Tranter from Creating Communities joins The Brekky Show for a small conversation that always leaves us thinking big thoughts. Today he shares another tip on “Small acts that build communities”. 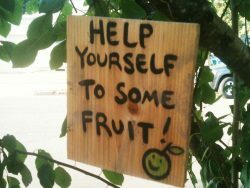 When Allan was walking around his neighbourhood earlier this week he noticed a couple of boxes on the footpath outside of different houses.. two had lemons one had grape-fruit and each had a sign that read ‘help yourself’! This time of year is great to share produce from your garden, or maybe you’re a jam maker or a baker? This is such a simple way to open up a new relationship. Allan pointed out that Morro is a mechanic and challenged him to help someone out in his neighbourhood who is having car trouble. So, what can you share? If nothing else… a smile, a cheery wave and a “hello”. This week try and build community by keeping a look out for what you can share and who you can share things with. Instead of random acts, how about regular acts of kindness?